Axonometric projection is used to convey the drawing is a representation of the shape of the object from different sides. In this view of the subject from different angles projected onto the plane of the cube. The slope of the planes in axonometric projection of a circle gives the shape of an ellipse. Because of the difficulty of constructing ellipses in practice they are replaced by ovals. A sheet of paper, pencil, compass, protractor, line or polygon. To construct a circle in perspective helps square, which is inscribed in the given circle. On the plane tilted square takes the form of a rhombus. Therefore, first build in the desired plane of the rhombus. Side must be equal to the diameter of the circle and parallel to the respective axes of projection. The center of the rhombus must coincide with the center of the circle. Consistently indicate the corners of a rhombus is constructed by points A, B, C and D. the point A must be located in that corner of the rhombus, which is closest to the point of intersection of the axes in axonometric projection. Draw the diagonal of the resulting diamond segments connecting points A and C and B and D. the Diagonal AC forms the minor axis of the oval, and the diagonal BD is great. The intersection of the ovals forms the center of the diamond and circle in the plane. Label it with the letter O.
Swipe through the center of the diamond O two lines that are parallel to the axes of the projection and divide the rhombus into 4 parts. Consistently indicate the points at which lines parallel to the axes of projection intersect the sides of the diamond with the letters E, F, G and H. Point E has to follow a point A in the same direction, which has consistently designated the angles of the rhombus. Connect the points A and G and C and E lines. Mark the points where the major axis of the rhombus intersects the segments AG and EC's letters I and J. At this point I must lie on the segment EC, and the point J on the segment EC. 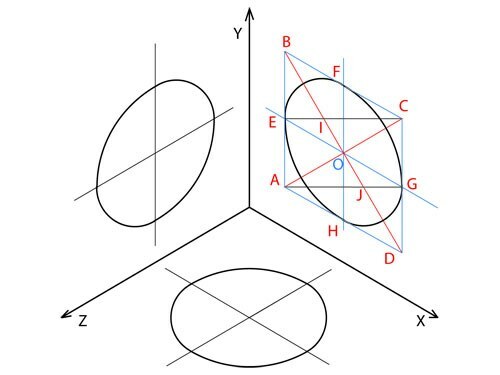 Using the compass, draw an arc between points E and F. the center of the circle arc is located at point I, and its radius equal to the length of the segment EI. Similarly, draw an arc between points G and H.
Draw two arcs that finished the construction of the ellipse on the projection. The first arc with the center of the circle at point A connects points F and G. the Radius of the first arc equal to the length of the segment AG. The second arc with the center of the circle located at point C, which connects points E and h Its radius equal to the segment EC. When you're finished drawing the second arc, you will receive built a circle in the plane of axonometric projection.